Most South Indian breakfast and snacks can’t do without coconut chutney – a coconut based dip that we all love to dunk our idli and dosas in. Coconuts are a quintessential part of coastal South Indian cuisine. Meals are cooked in coconut oil, curries are made with ground coconut or coconut milk, not to mention the variety of chutneys and desserts that are churned up using freshly grated coconut. From sweets to curries, chutneys to cooking oil, coconuts are heavily leveraged in South Indian cooking. 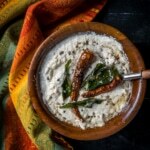 So, if you leftover coconut after making this chutney you could use the leftover coconut to make this easy 15-minute coconut barfi or these healthy, simple vegetarian or non-vegetarian Mangalorean recipes such as beans poriyal, cabbage poriyal, kori ajadina or this plantain dish (bareda kai ajadina). Now, let’s talk about the recipe in question – Coconut chutney or Nariyal chutney (Nariyal = Coconut in Hindi). How does coconut chutney taste? 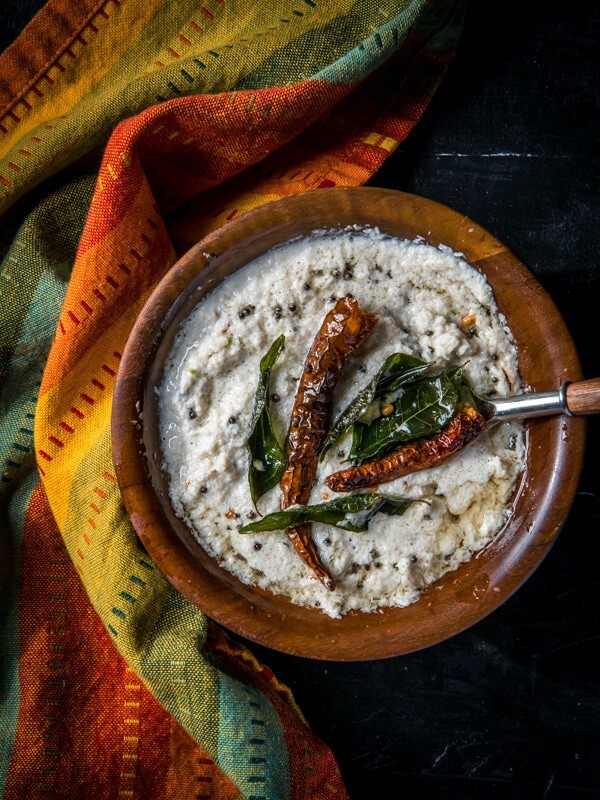 Typically coconut chutney has a bit of tang that comes from tamarind juice, a bit of heat from green chilies and tempering with coconut oil to enhance the flavor. Coconut chutney or Narial chutney may not taste great on its own but it brings the bland tasting dosas and idlis to life when they are paired together. How do you make authentic coconut chutney? 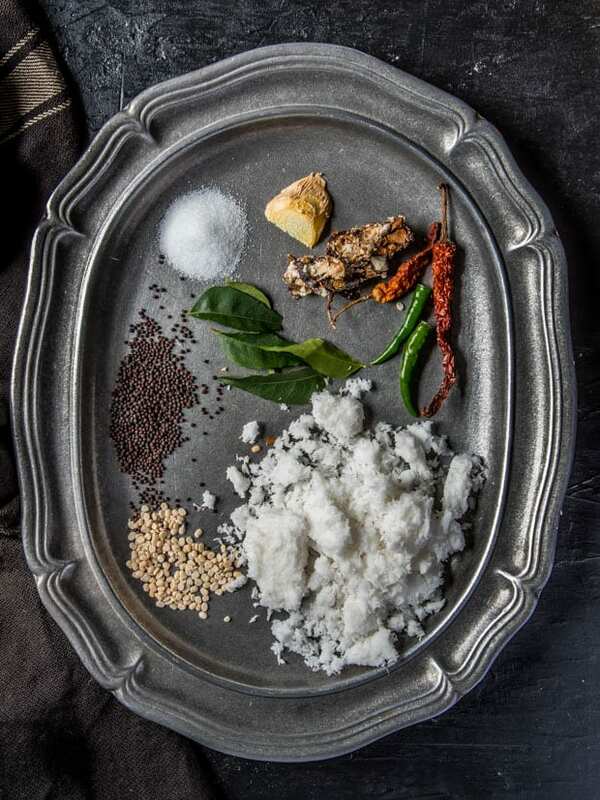 Ingredients in coconut chutney – To make coconut chutney, start with a cup of grated coconut and grind it to a fine paste along with salt, tamarind juice, ginger, and Thai green chilies. The chutney is then topped with a “tadka” which adds flavor – it’s essentially urad dal, red chilies, mustard seeds and curry leaves that has been tempered in coconut oil. 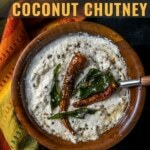 Now there are many variations to coconut chutney recipes. For instance, some add chopped cilantro, cashews, peanuts, roasted chana dal and some even include yogurt but for this recipe, we’ll stick to the most simple yet flavorful version that works well with all kinds of dosas, idli, and Pongal. While freshly grated coconut is preferred frozen grated coconut will work as well. If you cannot get hands on fresh tamarind, tamarind paste is a good option but not tamarind concentrate. Though Tamarind concentrate gives your chutney the desired tang it also darkens the color of the chutney – so use it as a last resort. If using fresh tamarind, take chunks of tamarind from the package. Soak it in 1/2 cup hot water for about 10 minutes before use. You can also substitute fresh tamarind with 1/2 teaspoon tamarind paste or 1/2 a tablespoon of lime juice. How many calories are in coconut chutney? Around 2 tablespoons of coconut chutney would be approximately 120 calories. How long does coconut chutney last? It is best to refrigerate coconut chutney within a few hours of making it. The taste will not be impacted for 2 – 3 days under refrigeration. You can freeze the chutney to make it last for about 3 months. Red chili chutney – a spicy and tangy chutney perfect for south Indian snacks. Coriander chutney – This green chutney is perfect for street food. Coriander-mint chutney – A delicious combination of cilantro and mint makes it perfect for sandwiches, idlis, and even street food. Learn how to make coconut chutney – a coconut based dip that we all love to dunk our idli and dosas in and is a must-have accompaniment for most South Indian breakfast and snacks. If using fresh tamarind, soak in 1/2 cup hot water for 10 minutes. Run it through a sieve to filter the juice out. Grind coconut along with tamarind paste or tamarind juice from step 1 [read note 1 and 2], green chilies and salt to a fine paste in a blender using water as needed [see note 3]. Heat oil in a small pan on medium heat. Add mustard seeds and as they start spluttering add urad dal, byadgi chilies and curry leaves and after 10 -15 seconds take the pan off heat immediately. Add the tempering to ground coconut paste and mix well. 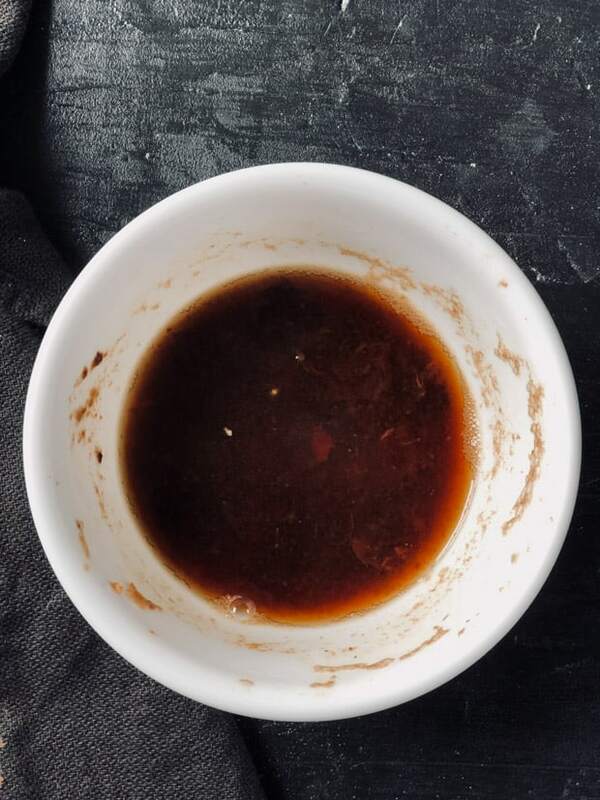 It is hard to predict how tangy the tamarind juice will be, so always add 1/2 of the tamarind juice first, do a taste test and add the remaining. If you are using juice from tamarind soaked in 1/2 cup of water, you may not need additional water to grind the chutney. When you say “grind” the coconut etc. do you have in mind a stone grinder or a mixie or a Vita-Mix? Would you recommend for a green chile to use jalapeno or Serrano? And when you say split chile I assume you mean seeded, but you did not say so, so perhaps not. Do you have a preference? Doc – I updated the recipe in response to your comment. You could grind it in any of the options you have listed. Thai chili peppers are the closest to Indian chili peppers so that’s a good substitute. Just roughly chop the chilies – that should be sufficient.